Placer Theatre Ballet photo courtesy of Scott Belding Photography; Placer Pops Chorale photo courtesy of Anne Sterling; Roseville Theatre Arts Academy photo courtesy of Marie Ortman Photography; Auburn Symphony photo courtesy of David Barpal. The holiday season – the most spectacular time of the year to take in a live performance – is upon us. You’ll find the best and the brightest stars performing a wide breadth of music, song, dance and theater in many year-end productions. To help you decide how to best manage your already heavily booked holiday schedule, we’ve highlighted performances close to home. From family-friendly choir concerts to breathtaking classical ballets, you’ll find something to entertain all of your friends and family this holiday season. The Placer Theatre Ballet will perform The Nutcracker on the weekends of December 1-2 and 8-9 (show times vary) at the Placer High School Theater in Auburn. Experience the timeless beauty of this ballet as performed by the finest local dancers of all ages, along with professional dance artists. A treasure to behold for everyone, young and old. Don’t miss your chance to take in a show this holiday season. To purchase tickets (special seating and group tickets available), call 916-630-7820. Join the Placer Pops Chorale and their orchestra for A Holiday Homecoming. Let the spirit of the season come alive and enjoy the innovative arrangements of Christmas classics, including “Joy to the World,” “The Christmas Song” and “God Bless Us Everyone” from Disney’s A Christmas Carol. This diverse group of vocalists – men and women of all ages – perform a select few concerts throughout the year. Don’t miss your chance to see them live on December 14 (7:30 p.m.), 15 and 16 (2 p.m.) at Sierra College’s Deitrich Theater. For more information and to purchase tickets, visit placerpops.org. 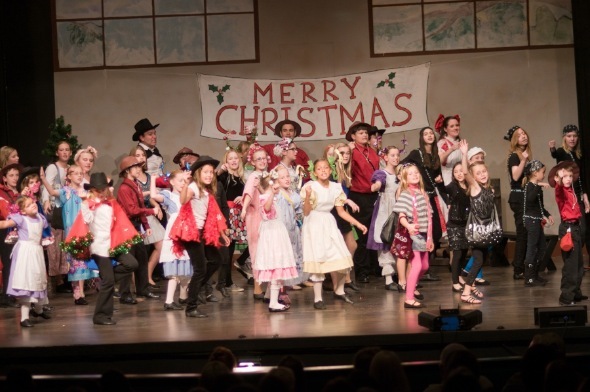 After 10 long years, the Roseville Theatre Arts Academy is reviving their beloved Christmas Children show. A crazy mix of homeless children, society kids, and rapping elves work together to bring back the meaning of friendship and community in a family-friendly show that takes place between the Big City and the North Pole. Enjoy this delightful holiday tale, full of laughs and lessons, with the added merriment of musical numbers including “Santa Baby, “We Need a Little Christmas” and the “Santa Rap.” Christmas Children hits the Roseville Theatre stage December 6-7 and 13-14 at 7 p.m. For tickets and more information, call 916-772-2777. The Auburn Symphony, accompanied by four very talented soloists, will once again hold their annual sing-along performance of Handel’s oratorio Messiah. Don’t miss the chance to immerse yourself in or introduce your children to the glory of this classical masterpiece. The Auburn Symphony will perform one night only, December 11 at 7:30 p.m., at the Placer High School Theater. For tickets and more information visit auburnsymphony.com.